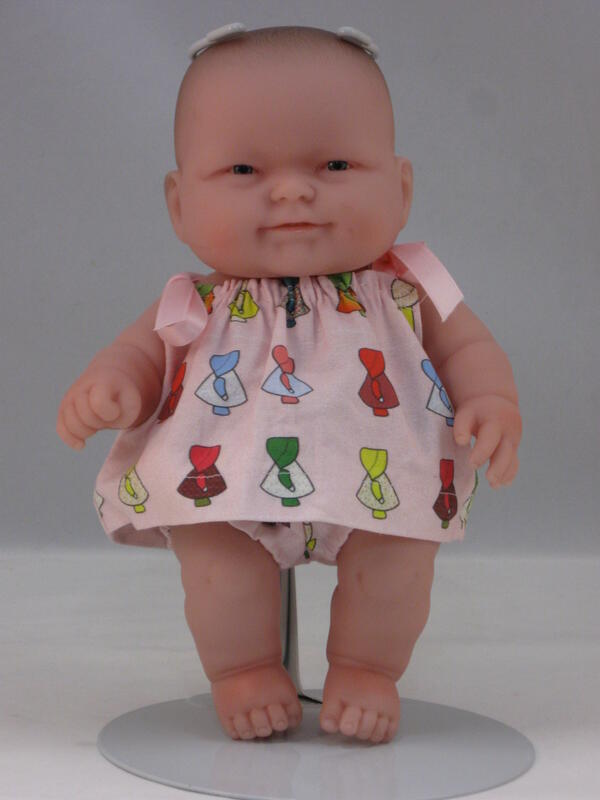 I receive a lot of pleasure from doll pattern making. One nice surprise has been the e-mail friends that I have made over the years. 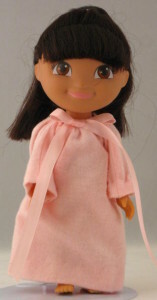 One lovely lady that I am corresponding with has a personal doll ministry. She buys, dresses, and makes dolls all year to give to various charities serving children. She has been frustrated lately while trying to come up with a pattern for a group of cherubic baby bath dolls that she wants to dress. 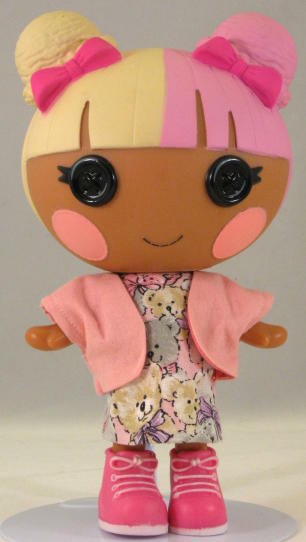 When I agreed to try to adapt some of my patterns to fit the doll, she generously sent me a doll to work with. 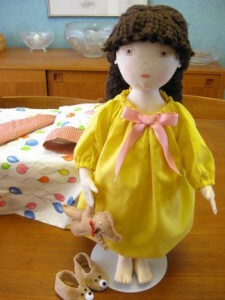 I have a much easier time altering patterns, if I have the doll in front of me. 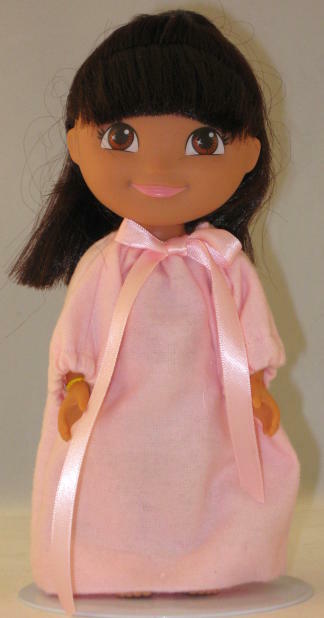 Of course the doll will be donated to a Christmas toy drive. 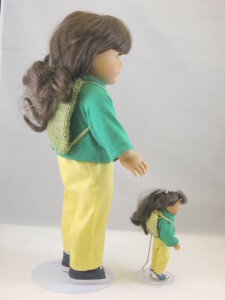 As soon as I started working with this doll, I realized a problem with the way dolls are sized. 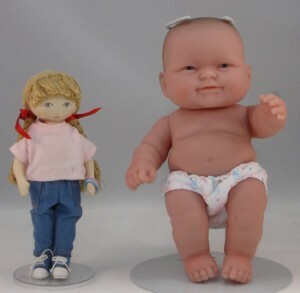 On Amazon this doll is described as an 8 inch doll. 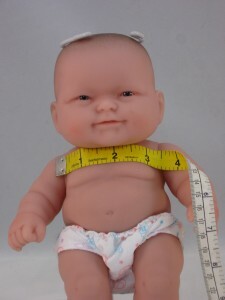 I measured her as a 9 inch doll. The variation in height is not only problem with trying to select a pattern to alter to fit this doll. 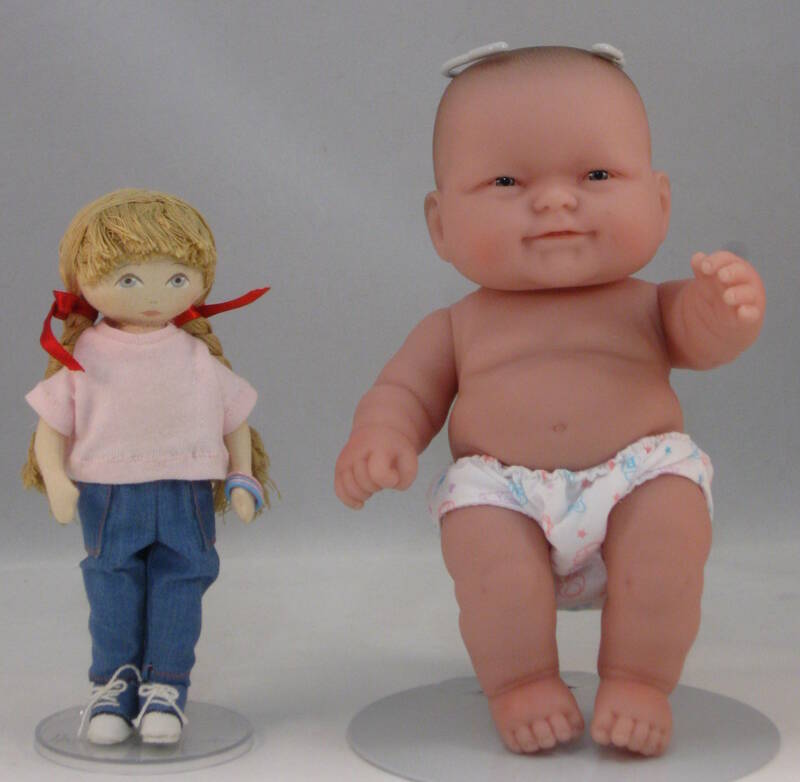 Compare the bath doll with my 7½ inch Florabunda. 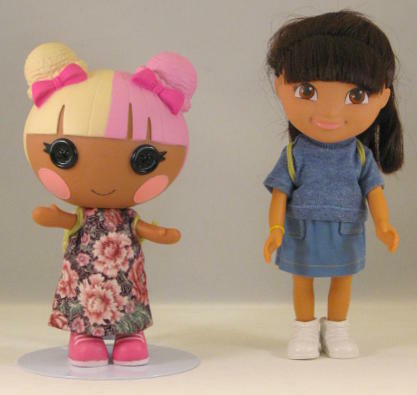 The two dolls may be close to the same height, but the difference in width makes them very different sizes. 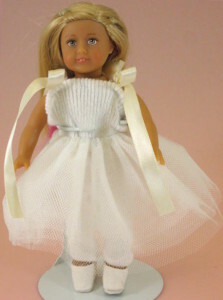 I decided to look at an easy pattern for an eighteen inch doll. 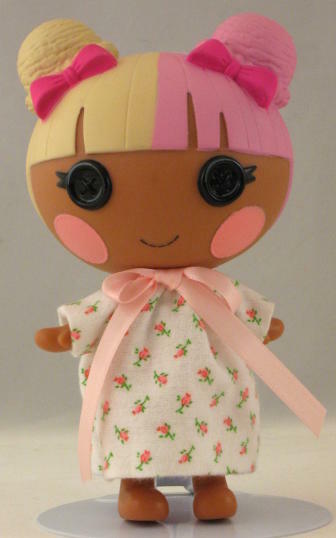 The Summer Top pattern from my book Learn to Sew for Your Doll, is an easy pattern and about the right length for a dress for my bath doll. 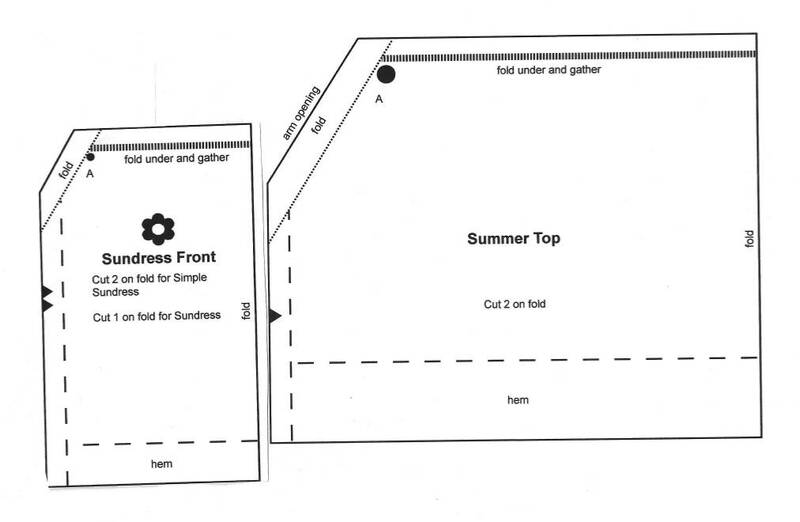 Compare the Summer Top to the sundress pattern for Florabunda. 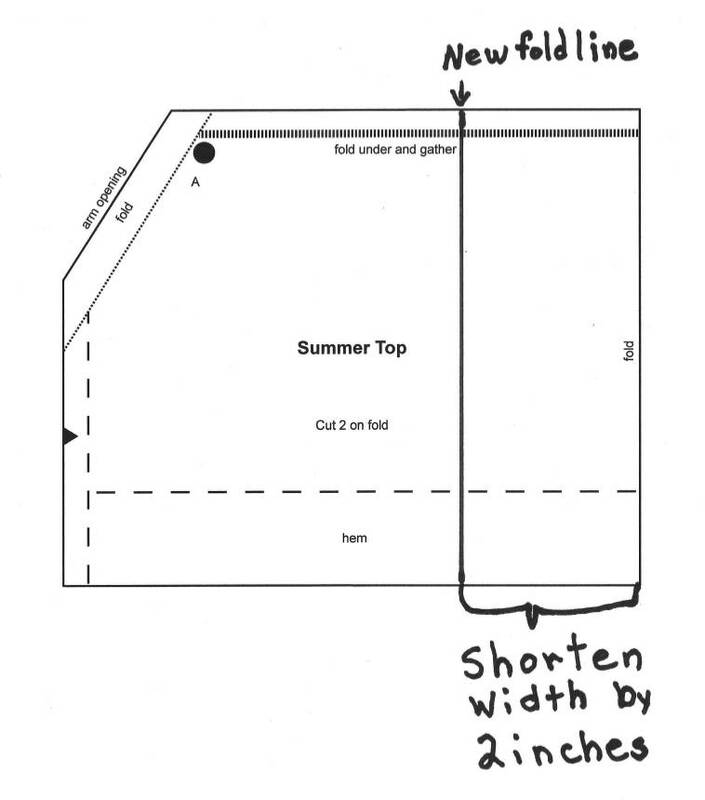 If the only factors to consider were height and width, I could choose between shrinking the width of the Summer Top or increasing the width of the smaller sundress. The arm opening of the large pattern is very different from the opening of the small one . 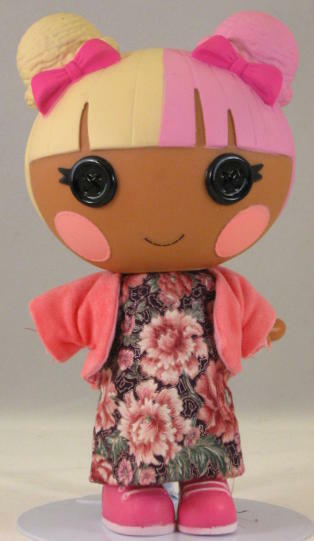 If you compare the arm size of the bath doll to Florabunda’s arms, you can see that I need a larger arm opening for the bath doll. I decided to use the Summer Top pattern. To determine how much to decrease the width, I measured the bath doll across the shoulders and measured 3.5 inches. I decided to make my pattern about 6.5 inches wide. It will be gathered at the top to fit the doll’s 3.5 inch shoulders. Because my pattern is cut on the fold, I divided 6.5 in half to alter the pattern. 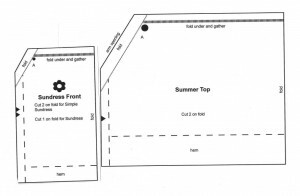 Follow the directions for the sundress or summer top to use the new pattern. 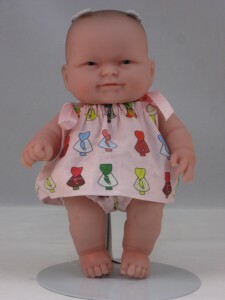 In my next blog, I will discuss making a diaper cover using the shorts pattern from Learn to Sew for Your Doll. I have neglected my blog for over a year now. I thought I would explain how I got out of the habit of blogging. My experience has a slight connection or two with sewing. 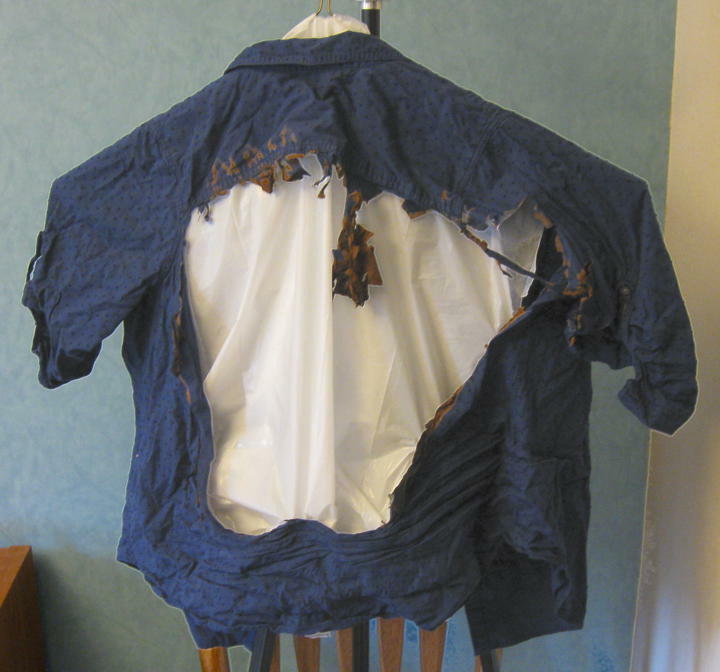 In February of 2015 I had the flame on the large burner of my gas stove top adjusted too high and accidentally caught the back of my shirt on fire. With the help of my husband, I extinguished the blaze in a few seconds, using the flexible hose from the sink. I had to go to the emergency room, because I had extensive burns on my back. Although I had to see a plastic surgeon to be evaluated, I did not have to have any skin grafts. It took over six months for my burns to heal and my energy level was lower than normal for all that time. I got out of the habit of blogging and neglected blogging longer than I needed to. I am trying to return to blogging now. I learned something about fabric from my fiery adventure. Cotton is very flammable. The back of my shirt was in flames in a matter of seconds. Here is a picture of the shirt I was wearing that day. As you can see, there is a large hole in the back of the shirt. Now I understand why infants’ clothing is treated with a flame retardant. I think that fabric treatment is an excellent idea. I also found a surprising use for my sewing skills. My husband had to apply a prescription cream to my back daily for several months. The plastic surgeon wanted the cream to be covered by bandages, but at first my back was completely covered with burns, so there was no place to tape the bandages. My doctor suggested that I buy very tight T-shirts and use the shirt to hold the bandages in place. It was hard to slip the shirt on without disturbing the bandages and the bandages didn’t stay in place very long. 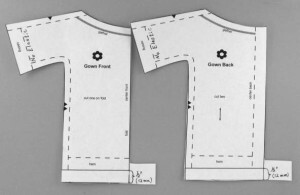 I began experimenting with ways to sew the bandages to the back of the T-shirt. After trial and error, I tie-tacked the bandages onto the shirt back, using the technique that is sometimes used to hold the layers of a small quilt together. The surgeon’s assistant was very complimentary about my invention. She told the doctor that I sutured the bandages to the shirt. I thought that her statement, using the surgical term for sewing, was a very kind analogy. I take pride and pleasure in my sewing skills, but my talent is nothing extraordinary. The really remarkable sewing in our day and age comes from the hands of a skilled surgeon. That type of sewing can heal wounds and save lives. I was glad to be able to make my own healing easier by using my sewing skill. Please be very careful in the kitchen, especially around gas stove tops. Cooking is more dangerous than you think. Also, if you don’t know how, learn to sew. It will come in handy. About a year ago Soft Dolls and Animals! published an article that I wrote about making cloth doll toes. 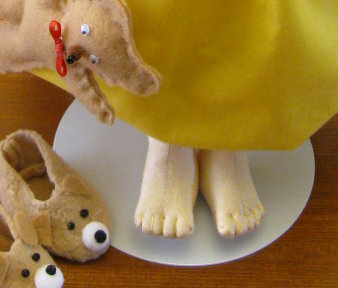 My eighteen inch (46 cm) cloth doll Kitty has toes made from my method of making doll toes. Here is a close up of the toes. 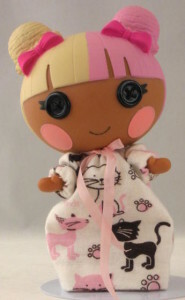 You can purchase and down load Kitty’s pattern from My Patterns page by clicking here. Kitty’s pattern is also found in my book, Sewing for Large Dolls. You can find out how to order the book from My Books page by clicking here. My small dolls also have toe instructions included in their patterns. 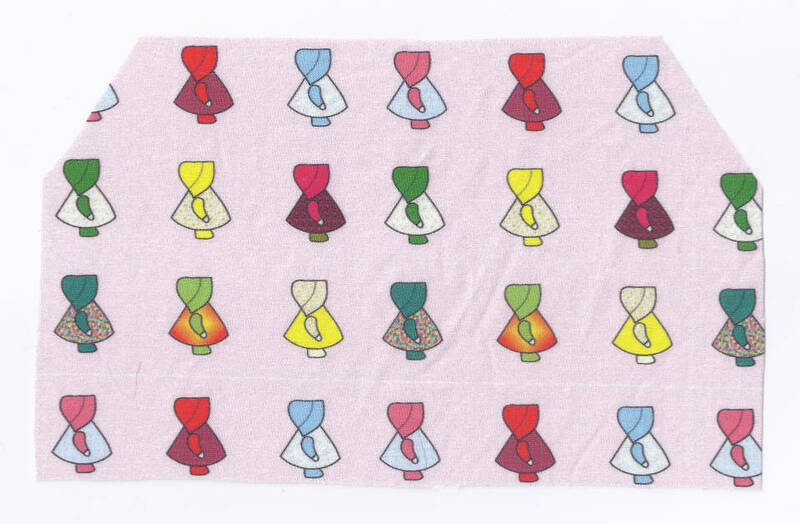 To make the dance skirt, make three copies of my A-line skirt pattern. Cut the hem off all three pattern pieces. 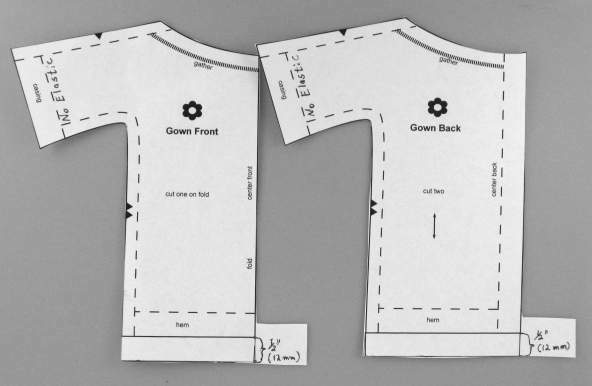 For the back pattern piece, use the entire pattern without the hem. 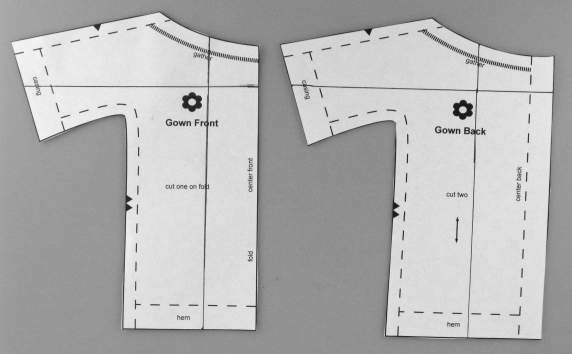 For the right front, use the entire skirt waist, but cut a curve starting at the hem line and stopping half way up the side cut line. I traced around a drinking glass to get a smooth curve. For the left front the top of the skirt start at the side seam and measure one and one eighth inch (about 3 cm) at the waist line. Mark the measured point. Draw a straight line down the skirt from the measured point for about one and three quarters inch (4.5 cm). Then begin curving the line back to the bottom of the side seam. 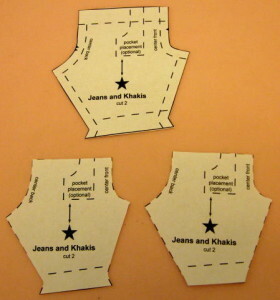 From fabric, cut two of each pattern piece. 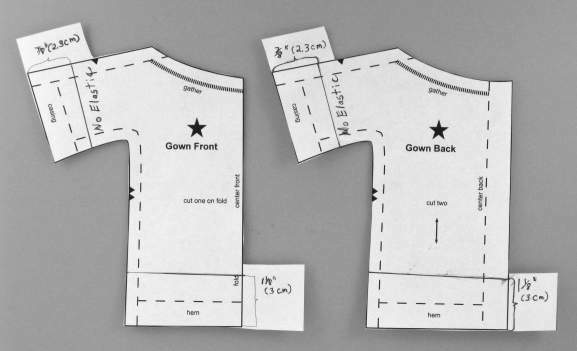 You will use the second set of pattern pieces to line the skirt. Sew the skirt left front and skirt back together at the side seam. Sew the left front skirt lining to the back skirt lining down the side seam. 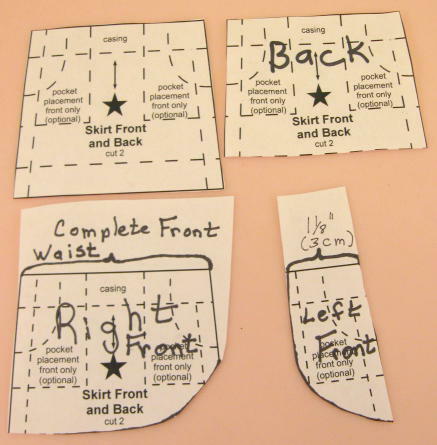 Sew the left front/skirt back piece to its lining down the curve and hem. 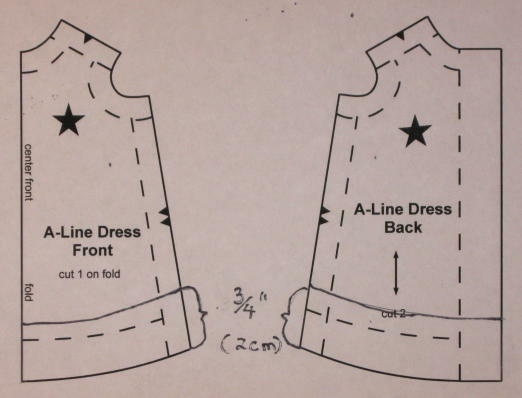 Sew the right front and right front lining together down curve and hem. Trim the pieces, turn and press. Lap the lined right front piece over the left front/skirt back piece. 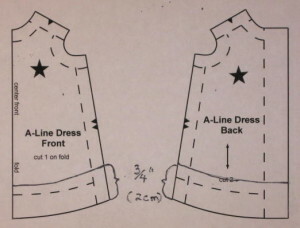 Line up the edge of the right front with the left front/skirt back side seam. Pin and then had baste the two pieces together. Finish and then fold over the top edge of the skirt to make an elastic casing, and follow the directions in my pattern guide to finish the skirt. Put the skirt on the doll and tie a matching or contrasting ribbon around the waist. For free tips for making an elastic casing download my free Tools, Tips, and Techniques booklet and look on page 9 of the booklet. 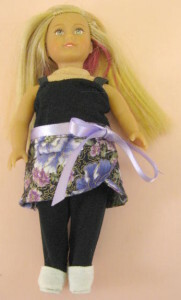 You can purchase a download of my pattern Pants, Skirt and T-shirt from the small doll section of my Pattern page. It is the fifth pattern in that section. If you are only interested in AG mini dolls, the pattern is also in my book, Sewing for Mini Dolls. 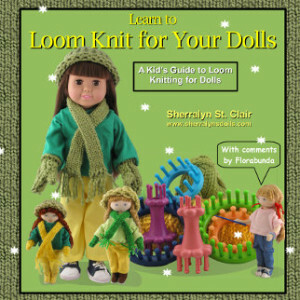 If you only want mini doll patterns, I think that the book is the best buy. You can find out how to order it from My Books page. Last week I showed you how to make the tights and top for this outfit. If you found this article from a web search, you may not have access to the rest of my blog. If you would like to make the tights and top, go to my blog and search for August 9, 2014. I adapted the pants pattern from my Pants, Skirt and T-shirt pattern for Twinkle to make the tights. 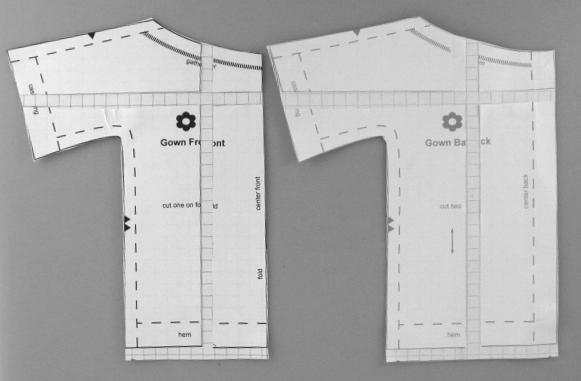 Make a copy of the pants pattern. 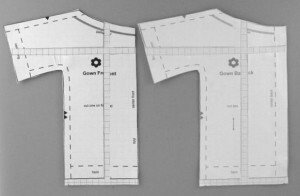 Cut off the side seam allowances and the fold line for the elastic casing. Fold in the side hem tabs at the bottom of the leg pattern. For top and tights use a ladies thin black sock. 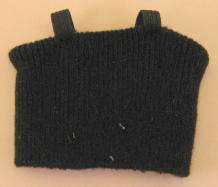 Use black elastic for the top’s straps. 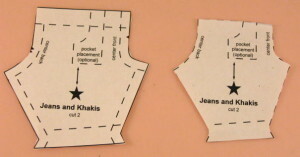 Follow the pants pattern directions to make the tights. I sewed the elastic casing at the waist by hand, because the sewing machine tended to stretch the sock fabric too much. After inserting the elastic use a quarter inch (6 mm) seam with a zigzag stitch to sew the back seam and the inside of the legs. Sew across the bottom of each pant leg, so that the doll’s feet stay inside the tights. 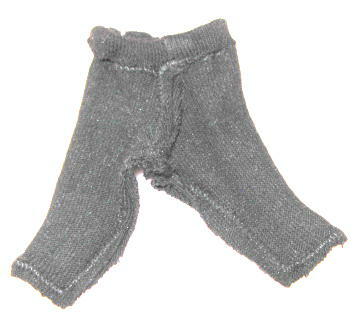 The doll’s top is made from the top of the sock, after the tights have been cut out. Try the sock top on the doll, by having her “step into” the sock top. 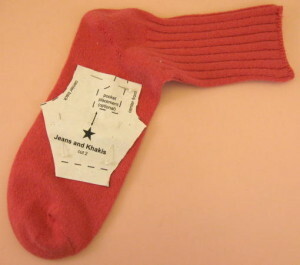 The cut end of the sock should be pulled up to just below her shoulders. The finished end of the sock should be at her waist. Trim the cut edge of the sock to shape it like a doll’s top. Remember to leave enough of the trimmed sock fabric to add a hem. I had to make a seam down the back of the top to make it small enough to fit the doll. Hem the shoulder/neck/arm opening by hand and add black elastic at the shoulders. Next week I will show ;you how to make a dance skirt to complete the outfit. This dance ensemble for AG mini dolls is made from a ladies’ thin sock, elastic, ribbon and tulle fabric. I adapted the pants pattern from my Pants, Skirt and T-shirt pattern to make leggings. I made a copy of the pants pattern and cut off the side seam allowances and the fold line for the elastic casing. Cut the leggings from the foot and toe end of the sock. 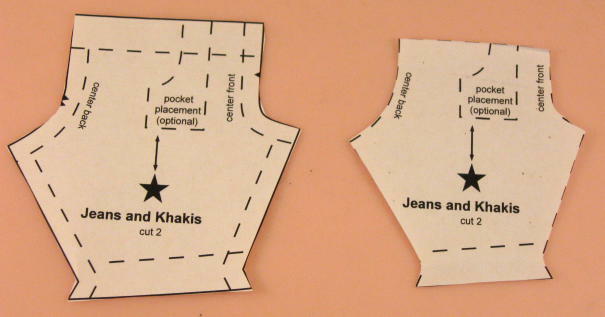 Follow the pants directions to make the leggings. 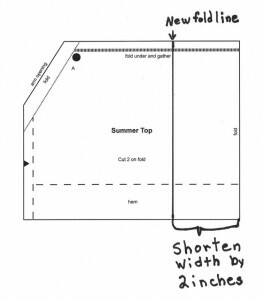 Use a quarter inch (6 mm) seam but sew the seam with a zigzag stitch. I sewed the elastic casing at the waist and the leg hems by hand, because the sewing machine tended to stretch the sock fabric too much. 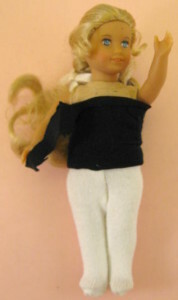 The doll’s top is made from the top of the sock, after the leggings have been cut out. Try the sock top on the doll, by having her “step into” the sock top. 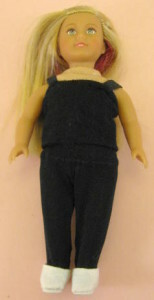 The cut end of the sock should be pulled up to just below her shoulders. The finished end of the sock should be at her waist. Trim the cut edge of the sock to shape it like a doll’s top. Remember to leave enough of the sock fabric to add a hem. I hemmed the shoulder/neck/ arm opening by hand to prevent the sewing machine from stretching the fabric. 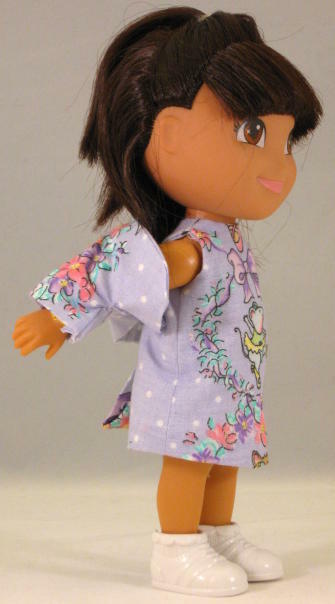 I had to make a seam down the back of the top to make it small enough to fit the doll. Hem the shoulder/neck/arm opening by hand. Add ribbon ties at the shoulders. For the tutu, cut four 16 inches by 5 inches (41 cm by 12 cm) rectangles of tulle. Stack the tulle rectangles together and fold them lengthwise to make stack of folded rectangles measuring 16 inches by 2.5 inches (41 cm by 6 cm). Make an elastic casing by sewing a seam three eighth inch (1 cm) from the folded edge of the tulle stack. Insert about 5.5inches (14 cm) of one eighth inch (3 mm) wide elastic. Secure the elastic on both sides and then sew the two short sides of the gathered rectangle together to make the tutu back.